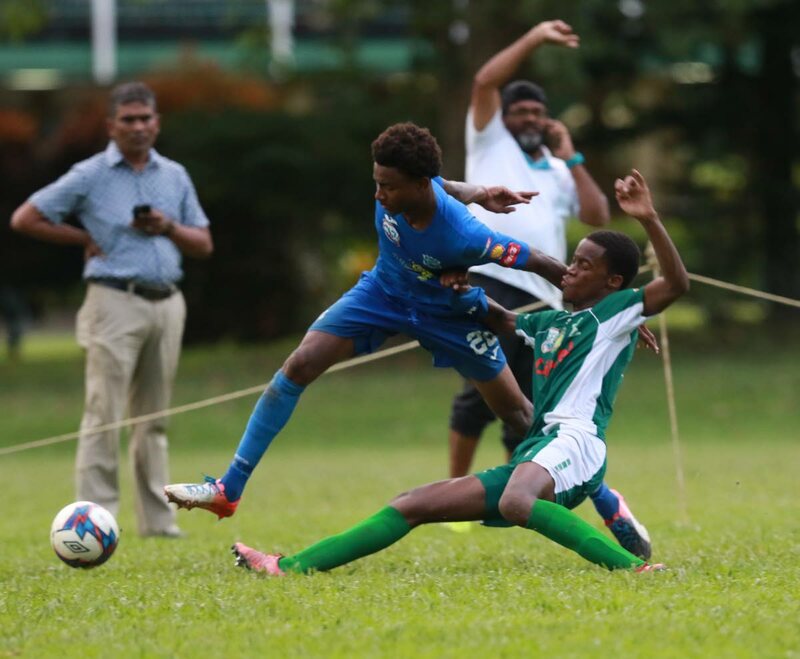 NAPARIMA dethroned Presentation San Fernando as champions of the Secondary Schools Football League (SSFL) Premier Division, after a dramatic day of action in the final round yesterday. Entering yesterday’s rescheduled Round 11 matches, Presentation San Fernando were on 32 points, followed by Naparima with 31 and San Juan North with 29. 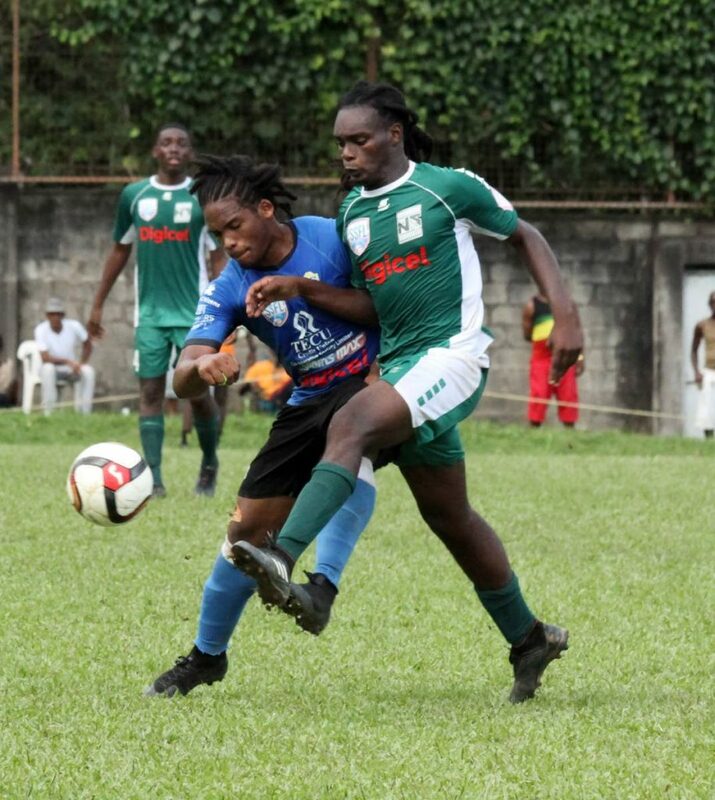 Naparima, the 2015 Premier Division winners, travelled to Maraval and defeated Trinity Moka 2-0, with strikes from Nathaniel Perouse, in the 26th minute, and Jeron Pantor in the 64th. Presentation San Fernando, the 2017 champs, also made the trip from South, to Bourg Mulatresse in Santa Cruz, to oppose San Juan North. However, that game ended in a 1-1 draw. Presentation College San Fernando's Ackeel Jacob,left, and San Juan North Secondary's Malik Farrier vie for the ball yesterday, in their SSFL Premier Division match, at San Juan North's school's grounds. Midfielder Mark Ramdeen missed the latter matches this season due to national Under-20 team duties. Eve, the ex-national men’s team midfielder and captain, noted, “Mark is a different player, but we coach a squad of players and we believe in every one of (them). On the opposite end of the 15-team points standings, 2018 debutants Valencia joined Fatima and Bishop’s High as the teams relegated to the Championship Division. Heading into yesterday’s games, St Mary’s were on 12th place with 14 points, followed by Valencia with 12 points. Ironically, the already-relegated Fatima consigned Valencia to the drop, courtesy of a 3-2 win at Valencia. St Mary’s, on the other hand, defeated Trinity East 4-2 at the St Mary’s Ground, St Clair. Two other games were contested yesterday. East Mucurapo beat St Anthony’s 2-0 at the Fatima Ground in Mucurapo and QRC were held to a 1-1 draw by Carapichaima East at the QRC Ground, St Clair. Reply to "Naps beat Trinity Moka 2-0 to take SSFL title"